The burger that’s so monstrous, they had to give it a robot-superhero name. I can see it now: Jack Black is… "THE BACONATOR." What better way to start off The Skinny Pig than with a post about bacon? 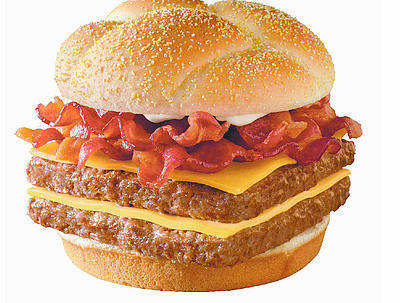 Well, being a Skinny Pig, a Wendy’s fan and a bacon fan, I have to say I was beyond shocked when I discovered they replaced my favorite Big Bacon Classic with the almighty Baconator. On any given night, I would get that craving for bacon and go to Wendy’s drive-thru and order the #4: Big Bacon Classic, fries and a coke. Well those days are long gone since the Baconator arrived. At first I refused to try it, but I have to admit I was curious. Two beef patties with six strips of bacon? Sounds like the perfect marriage of two saturated fats. So last week, I finally gave it a shot. The result? Well after I woke up from my salt-induced coma, arms aching, I decided it was pretty good. I suggest going to the gym before eating this burger to pump up your arms a little, the sheer weight was that of a small dog. And while I think it could have done without the extra beef patty, the amount of bacon was all you could taste anyway. After devouring the Baconator with a side of fries, I felt like I swallowed a bag of marbles. They should award customers with some sort of cash prize for finishing it, or at least give a complimentary heart exam. In the end, I still think that the Big Bacon Classic was better and wish they could coexist peacefully. However, in that case they would probably have to downgrade it’s dominant name from the Baconator to it’s sidekick, Bacon Boy.